Frequently Asked Questions About Calf Pro? Coccidiosis is an animal health problem caused by certain micro-organisms called coccidia or oocysts. They are hidden from sight, and can live for years in the environment, and survive under normal heat and cold changes. Stress caused by weather, feed changes, and weaning make dairy calves very susceptible to coccidiosis outbreaks. Calves ingest the infective parasites (oocysts) right from the start, by licking hair coats, nibbling on bedding and other contaminated materials. 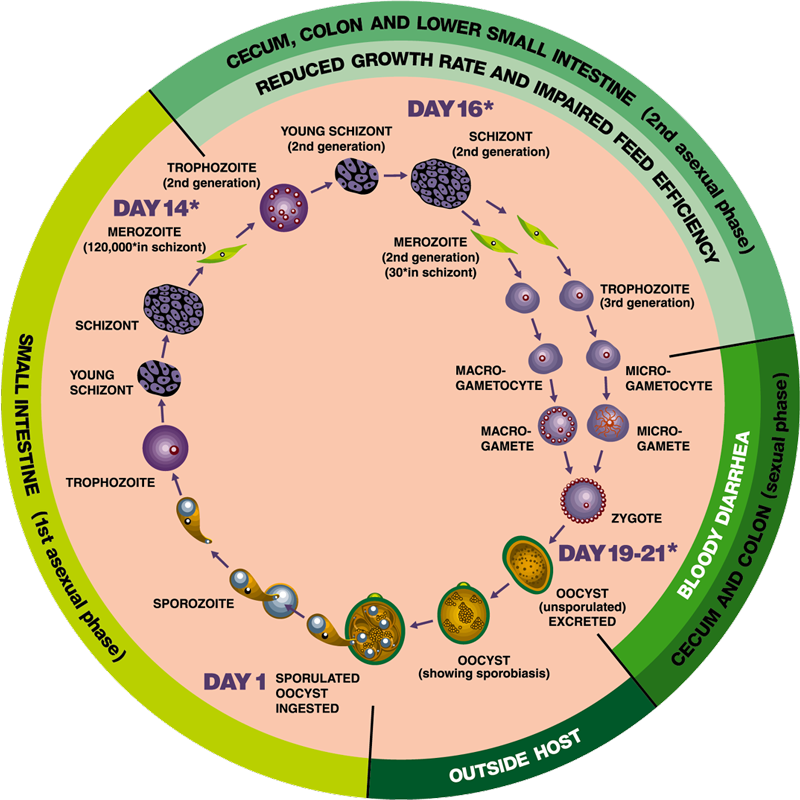 The typical life cycle for the Eimeria species of bovine coccidia last about three weeks. The sporulated oocysts are ingested by the calf, and rupture releasing sporozoites that infect epithelial cells of the gut mucosa. If the sporozoites are not stopped at this point of the life cycle they continue to reproduce (asexually) within the cell wall developing into millions of organisms. After about 14 days, the organisms reproduce sexually and invade the large intestine causing hemorrhaging which results in the clinical signs of bloody diarrhea. Damage to the intestinal lining may become permanent, resulting in poor performing animals. In severe cases, death occurs as a primary result of the diarrhea, which causes a loss of electrolytes and dehydration. Calf Pro is a unique liquid formulation of Bovatec (lasalocid), a coccidiocide plus 8 essential vitamins. It acts early in the life cycle of the coccidia before they mature and cause intestinal damage. Intestinal damage is responsible for poor nutrient absorption, water and electrolytes. Calf Pro provides immediate protection from the first feeding, starting 48 to 72 hours after birth. It eliminates the need to wait until calves consume enough dry for adequate protection. Calves seldom eat enough dry starter until 4 to 5 weeks of age. Clinical Coccidial infections are usually not noticeable until three to four weeks of age or older. That’s because the oocysts take 3 to 4 weeks to develop and cycle through the digestive tract and cause the diarrhea symptoms. The infection begins at the time of ingestion. It’s during the development time that the parasites do their damage. Prevention is the best method for control. Calves can ingest the coccidial parasite (oocyst) soon after birth, however, only about 5% of calves exhibit clinical signs of infection (bloody scours and dehydration. Subclinical infections reduce the absorption of critical nutrients resulting in slower weight gains. When should I start using Calf Pro? Use Calf Pro starting 48 - 72 hours after birth. Ingestion of cocci oocysts can occur at Day One. Early prevention is most effective. Should I feed Calf Pro with colostrum? No. The intestinal villae have large openings for the absorption of the immunoglobulins, and a large amount of the lasalocid will be absorbed. Wait until colostrum feeding has finished. Calf Pro acts in the small intestine, not systemically or through the blood stream. Any parasites ingested the first day or two will be destroyed at the initial feeding of Calf Pro. Is Calf Pro effective for the treatment of coccidiosis, if clinical signs are observed? No, Calf Pro is a prevention medication and contains an ionophore, (lasalocid or Bovatec) which kills the parasites in the early stages of development. Calf Pro prevents or controls the later stages of infection from occurring. Why does Calf Pro contain vitamins ? Calf Pro is formulated for addition to whole milk, which does not contain enough essential vitamins for calves until the rumen is fully developed at approximately 8 weeks of age. Each 10 ml of Calf Pro contains 100 IU of vitamin E which is an excellent antioxidant vitamin as well as additional vitamins to provide maximum growth potential for healthy calves. Can I use Calf Pro with commercial milk replacer products? Yes, many milk replacers do not contain a coccidiocide, therefore it is beneficial to add Calf Pro starting 48 - 72 hours after birth. Calf Pro will not interfere with other medications that are approved for use in milk replacers. Why should I use Calf Pro, if I use Bovatec in my calf starter feed? Calves do not eat sufficient amounts of calf starter until they are 4 to 5 weeks of age to get the proper level of Bovatec medication. Remember, the oocysts can be ingested during the first week of life. How do I add Calf Pro to the milk? Calf Pro can be added to individual feeding buckets or bottles or it can be added to a container of milk that is further divided into individual feeders. Does Calf Pro need to be fed twice daily? Once daily is sufficient, however, adding appropriate levels at each feeding often eliminates feeding errors. Will Calf Pro settle out of suspension? Calf Pro will stay in suspension until diluted with milk. Calf Pro is easily dispersed into milk; however, the milk should be fed within a short time period. If not, stir the milk for good distribution. Does freezing hurt Calf Pro? Although not recommended, if Calf Pro is inadvertently subjected to freezing conditions, it can be thawed and used. Shake container before using. Are there any residue problems? No, Calf Pro will not cause any residue problems. Animals fed Bovatec do not have a feed withdrawal time prior to slaughter. Why does the label caution against the feeding of milk with lasalocid (Bovatec) to cats and dogs? Dogs are the most sensitive species to lasalocid toxic effects. No safe levels have been established for unapproved species. Can Calf Pro be used to protect against Cryptosporidium parvum (Crypto)? Calf Pro is not approved for the control or treatment of Crypto.